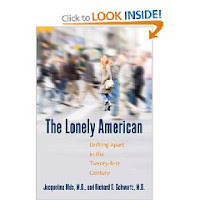 "The Lonely American: Drifting Apart in the Twenty-first Century", by Jacqueline Olds and Richard S. Schwartz. 2009. A point made by the authors, both psychiatrists, is that mental illness has been de-stigmatized to the extent that people are more comfortable admitting they are bi-polar than that they are lonely. Census data shows a continual increase of those living alone, now approaching 50%. The authors see loneliness as a symptom of getting "set in your ways" and urge roommates and family-unit living---to "maintain flexibility" as loneliness prevention. Hmmm. Cow thinking how she always has the thermostat exactly where she likes it. The way the house is always quiet when she wants to go to sleep, and how there's always only food she likes in the refrigerator. The only sounds are Cow-selected media (never music or stations she doesn't like). How the only messes are ones she makes, which she also cleans up. How housework is done when Cow feels like doing it, not before, not after. How, if Topiary needs trimming, it can wait till the whim strikes. Obviously, Cow has lost any flexibility she used to have. But then Topiary is hardly known for flexibility---nay, known instead for the beauteous shapes cast upon a perfectly trimmed lawn. Maybe Ms Cow needs a friendly next-door neighbour rather than a roommate. Gorilla: Were Cow to reside in the Congo, she couldn't ask for a better neighbour than wonderful GB! Ms. W: Ah, your blog is so beautiful and your prose so wonderfully tuned to the music of the spheres, Cow doesn't doubt that you, indeed, DO dance with the muse. For Cow, the best she can manage is to sway slightly in the breeze. I love living inside my head. Nobody bothers me when I am there. It is the only place I can truly be alone.